In this project we were challenged to design a library and its programme of services that would be built in a designated site in Brisbane. The site and context for the investigations would be the Howard Smith Wharves site in Brisbane, Australia. This project provided the opportunity to experience remote design collaboration with the School of Design at the Faculty of Built Environment and Engineering of Queensland University of Technology in Brisbane, Australia. In this international collaboration project, we were partnering with 3rd year Architecture students from QUT. We were Communicating primarily via electronic networks. 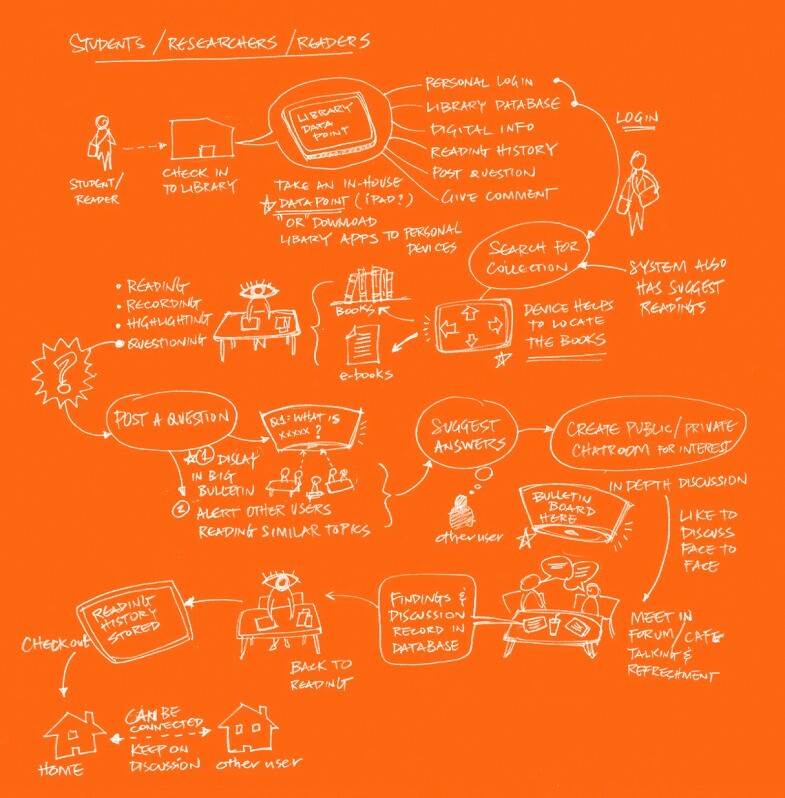 We worked in close collaboration with our QUT partners right from the beginning, to define the desired library programme for everyday scenario. In the latter part of the project during design implementation and visualization, our QUT partners were more concerned with designing the performative qualities of the architectural entities, while we contributed in terms of crafting and communicating the user experience, and designing a system of services and hardware/software products. Howard Smith Wharves (HSW) is on the edge of four distinct areas in center Brisbane. 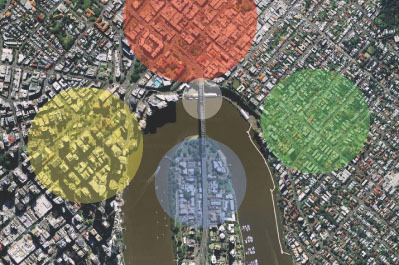 They are Brisbane City (CBD/Up Town shown yellow), Fortitude Valley (Down Town shown in red), New Farm (Mainly Low Rise Residential Area shown in green) and Kangaroo Point (High Rise Residential Area shown in blue). modern architecture is an organized commercial network emphasizing the necessity for both informational expertise and geographic intelligence. The traffic inside is responsible for the modern relationship between time, spatial movement, and the value of exchange. 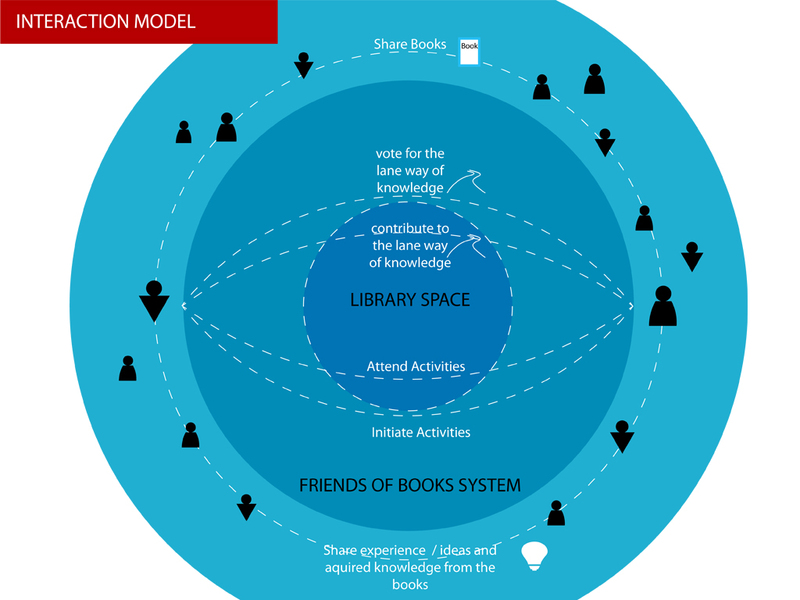 This could be reflected in our library design when the location can draw the flow of people from around the city, and the concept of library can become a hub for knowledge accumulation and exchange. Boundary between reality and virtual will be blurred, information can be accessed anywhere in real-time, mobile devices become ubiquitous. Brisbane is an emerging art & culture center in Australia after Sidney. Citizens are financially competitive, and being considered to be upper middle class “YUPPIES” among Australia cities. They are very aware of quality of life, and open-minded towards new things and exploration. The local social life is extremely varied. The CBD is fairly quiet along the edge oh HSW, however down town fortitude valley is Brisbane’s main nightlife precinct that makes an interesting space for HSW as it is below this area. New Farm is fairly upper market residential, as is Kangaroo Point. The areas have a high socio-economic tendency and the people who would flow through the space would fall in this bracket. In saying that, Fortitude Valley is also the densest area in the city for homeless people. 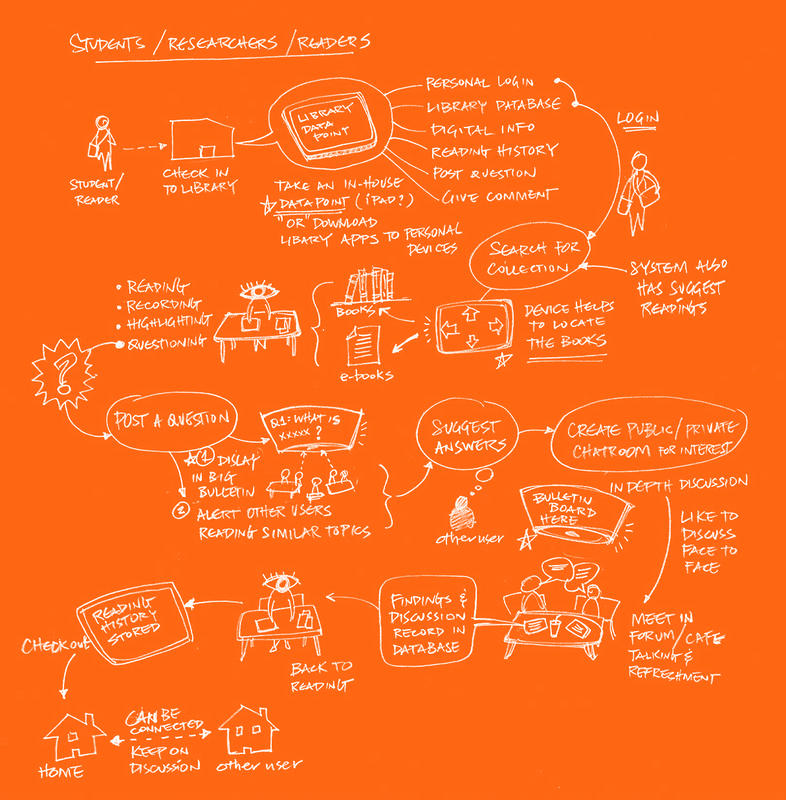 To explore the possible ways of how users will use the location, different user scenarios were sketched and analyzed. design opportunities were revealed and reviewed. The topology of Public space is the combination of commercial operations, trade and hierarchical assembly of urban landscape. It progresses from “at” (singular) to “across” (plural) sites in fluid ecology of exchange in context of modern city. Preserve the memories of your own communities. While most libraries have become the document archive of their community, the memories of a community span much more than just documents. What did it sound like to drive down Main Street in 1950? What did it smell like to walk into Joe’s Bakery in the early mornings of 1965? Who are the people in these community photos and why were they important? Memories come in many shapes and forms. Don’t let yours disappear. 1. The building site is in the center of multiple inner city regions. This is ideal for drawing a diverse range of people through the site in a lineal motion. 2. People in the neighborhood are relatively well educated and conscious about living quality and style. They are more adaptive to new ideology and way of doing things. 4. The trend of increasing digital reading materials alter our way of seeing LIBRARY to be a place for knowledge sharing and human interaction. Citizens will be encouraged to participate in the creation of this “TEMPLE of knowledge” by contributing their collection of books, reading materials, artifacts and expertise to the library. Library collections are not limited to books in the library anymore, but extend to the bookshelves of every citizen. Every citizen owns a piece of the library – sense of ownership. These will change the nature of library from a static building filled with books to dynamic spaces defined by the activities of participants. 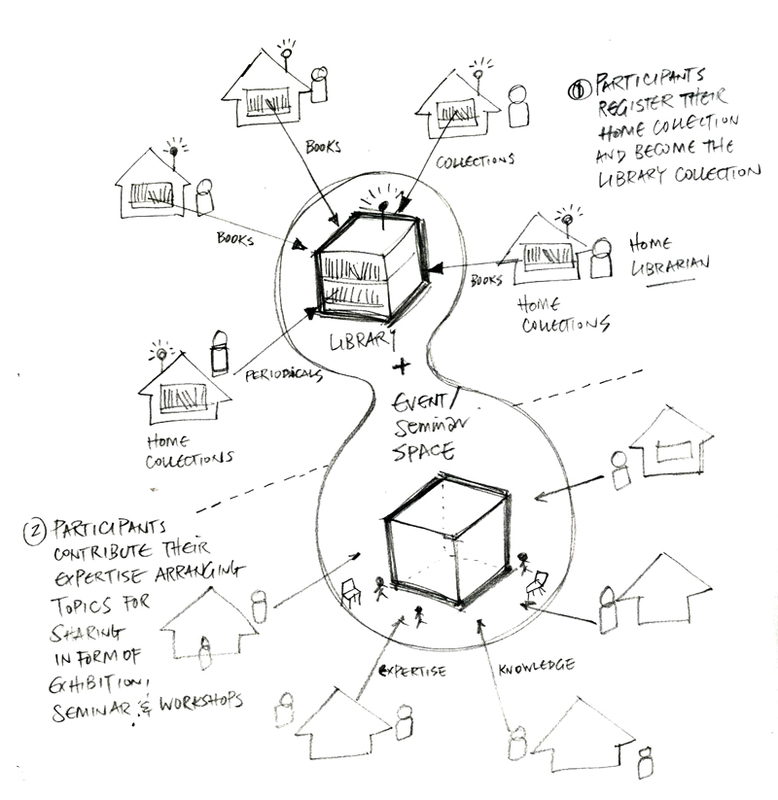 Interaction between people and the library will be activated when the invisible network of knowledge is extended. Workshops, seminars and other activities will be initiated and conducted by both the library and users. Citizens contribute to the flow of information and personal knowledge that in turn create collective memory of the city. The users within the whole system can interact with each other either in virtual library-“Friends of Books System” or physical library space. The whole city is actually a library where people can share books and talk about their experiences, ideas and acquired knowledge through the Friends of Books System. According to the hot topics people are caring about, library will initiate related events and activities like seminar, workshop, concert and so on to direct people to the library space, and learn about what they are interested in. Users can also initiate activities by themselves if they have great things to share and get enough support from other citizens. The lane way of knowledge is an unique part of the library which is actually built by all citizens. Users contribute their books, artifacts to the lane way as part of the library and other people can vote for their interests. Related activities will be held according to the popularity of the contributed components. Every citizen in Brisbane is a librarian. Easy to register their own books on the online system and share with our users. The participants can initiate and conduct their own workshops/seminars in the library for knowledge sharing and creation. The participants can easily get information and also express their interests for future events when they are passing through the lane-way of knowledge. The flexible space provides different usage spaces by users’ requirements in different periods during the day. In the article ‘same old new world cities’, “urban policy must start with productive capacity- the ability to generate wealth, in its widest sense, including social, environmental, intellectual, cultural and economic. In short shared values. The shared value of knowledge is important to the library, it can help people accumulate knowledge, create knowledge and share knowledge, it is a way of building a library as well as building the city itself. If people of the city can share what they have, what they experienced, it is very likely that the citizens can have a shared value of the city. An architecture is defined not by its neighboring buildings but instead by the infrastructure of the city.“ Also, we don’t want the library to be just a building located in a specific place, we want the influence of the library can be spotted everywhere in the city. It should be part of our life; the symbol of the library should a symbol of the knowledge, culture of the city. 1. BRISBANE MAP OF BOOKS – citizens can register their own collection to the library database and become “Friends of Books”, the physical location of books can construct the map of the city. 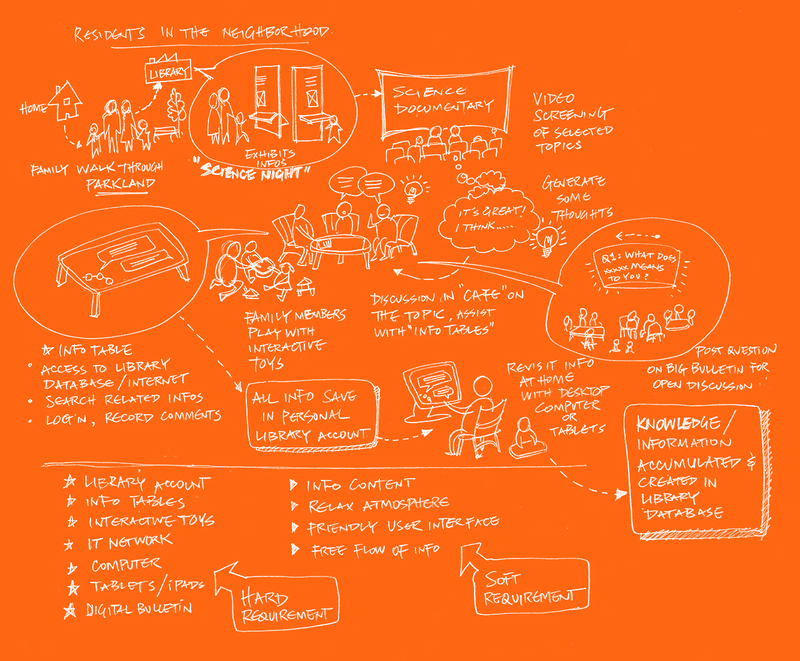 This visualizes the contribution of citizens and could also become an interactive book search of the library. 2. TRANSFORMATION OF SPACES – User initiated and library initiated workshops and seminars are facilitated by flexible use of library spaces. Face to face discussion is promoted. 3. THE LANE WAY OF KNOWLEDGE – citizens can contribute their books and memorable artifacts for the Lane-way extended throughout the interior of the library. It becomes a physical interface for users to interact with each other and with knowledge itself. 4. Library organize “BookX fair” for book exchange each month with themes like Movie, gardening, architecture, children book, mysteries, adventure, business, rare book hunt, most unexpected books etc. 5. Short video introducing proposed topics by users. The intro video will be displayed on display wall of library and other users can vote for their choices. 6. MY BOOK SHELF – users can upload photos of their book shelves and then composed into BIG pseudo book shelves in the interior and exterior of the library. With the new definition of library and Users, the concept of “The City is a LIBRARY and Every Citizen is a LIBRARIAN” is derived and successfully implemented through library program design and architectural strategy. The building site locates in the center of Brisbane City, and is a perfect location to draw the attention of people. The concept has considered the advantage of the location and also the flow of users in to and away from the site. The visual metaphor of street and laneway is a good representation of that idea. The architectural design enhances and facilitates this and makes the movement of users seamless. If the City is a library, it is also important to engage citizens of Brisbane in the establishment of library programs. A city is a living entity with the constant involvement of all citizens, so is the library. Therefore the library programme has been designed to facilitate the contribution of citizens. Everyone owns a part of the library, either physically or digitally. The library is a hub that facilitates interaction and leads to accumulation and sharing of personal knowledge, and the flexible architectural design also contributes to the needs of the different activities.